Nothing ruins a camping trip like not being able to start a fire. 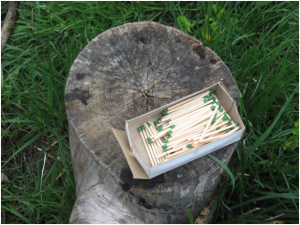 While there are several reasons why you may not be able to get a flame, one of the most common reasons is a wet match. But what can you do? One approach is to simply cover it with fingernail polish. This will work but just coating the match with fingernail polish will not make it a fire starter. To do that, you need to coat your matches with something special. What this special ingredient is for DIY waterproof matches and/or fire starters? Well, it is wax. You know that simple wax that candles and crayons are made of. To begin this process, you will first need to melt your wax. This will need to be done in a double broiler that you really do not care about. The melting of the wax will ruin the pan so do not pick out your finest from your culinary stash. If you do not have a double broiler or do not want to use the one you have, do not worry. A simple double broiler can be made from a clean coffer or vegetable can and a saucepan. Place the saucepan on the stove and fill about ½ full of water. Bring the water to a boil. Once it boils, place the coffee or vegetable can in the water. Fill this can with your wax, turn down the heat of the burner and wait. To speed up the melting process, stir the wax with a bamboo stick. While the wax is melting, get your matches ready. If you are looking to just waterproof the matches, simply dip the striking end of the match in the melting wax. Place on wax paper and allow to dry. If you want a waterproof match and fire starter, you will need to wrap the match with yarn or garden twine. There is no set rule as to how many wraps are needed but I will say the more wraps the better the fire starter will be. The only rule is to make sure to leave a tail of yarn at the end of the wrap. Once the matches have been wrapped, take the little tail that was left from your wrapping and use it as a handle to dip your match into the wax. Place the freshly dipped match on wax paper to dry and then repeat with another dip. The more you dip the longer your fire starter will last in the fire, which could be very important especially if you are trying to light wet wood. After you matches have dried, place in an old film canister or plastic bag. While this project is simple, I can tell you that having waterproof matches that also act as fire starters can be lifesaving. In a worse case situation where you cannot get the wood to light, the fire starter matches can be lit and just burned by themselves for supplemental heat and comfort.